What's my blood made of? 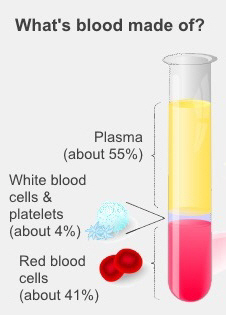 Your blood is a mixture of blood cells and a liquid called plasma. Red blood cells are what make your blood red. They contain a substance called haemoglobin, which carries oxygen around your body. You need iron, vitamin B12 and folic acid for these red blood cells to work properly. If you're low in red blood cells it's called anaemia. White blood cells are part of your immune system. They help you fight infections. Infections are the most common cause of high white blood cells. Platelets are tiny cell fragments which, with clotting factor proteins, help your blood to clot if you get cut. Plasma is a yellow liquid that contains many chemicals and proteins, which all do different things. They include clotting proteins, hormones, enzymes, antibodies, nutrients, sugars, and salts. America's Blood Centers – What is blood made from? This YouTube video animation explains the different parts of the blood, and what they all do. This page has much more detail, if you want a deeper understanding about bone marrow and blood cells. Written by HealthInfo clinical advisers. Endorsed by clinical director, Haematology Department, Canterbury DHB. Page created June 2015.